Now that was a GREAT race report! Congratulations on a great time and great finish. 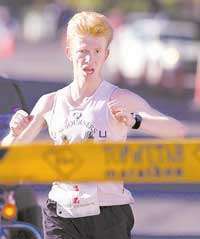 Very interesting race report, I can not believe how much you are able to think while you run. I do math in my head to keep my going, but it is much simpler. Wow, you really think through things, impressive how your brain works. OH, I liked the comment about how a marathon does not even start until mile 20. SO TRUE. Congrats on the great race. Love the amount of detail you remember about everything during your race. Seriously can't believe you ran that time, in clogs none the less. Way to get your PR since 2007. Great race report, awesome race! Good race Sasha. I could tell you were feeling good today as you went out pretty strong and then we never saw you again. Way to finish it off too. Hopefully Dave and I will get ourselves ready to "race" with you again. Great race, nice and steady! Good to hear you had such a great result and are getting back into your groove! I think that's the first race report that included a reference to a chess tournament. Great race, as usual. So nice to see you running that speed again! I was a great fan of yours from the TOU days! Great job Sasha. I'll let Bonnie run the stats on how geeky you are. But with that kind of speed it's excusable. Good job on fastest-ever clog marathon time. Great job on the race today Sasha. And nice talking to you and Sarah afterward. So after running it, how do you think UVM compares to SGM, TOU, and Ogden in terms of fastness of the course? Sub-2:32 in clogs! Nice job. That was a great race for you, your best in years from what I have seen. Nice job! Congratulations on a good race and a return to form! Sasha, that was a great run! Watching you take off so fast like that and being able to stay at a 6 pace for those last 6 miles is very strong! I felt good to mile 20 and my give a damn was busted after that. I think its amazing how the Kenyan runners can run in a group like that and then do the "wink" at each other and then pick the pace up to drop unsuspected runners. Nice one Sasha! Great to run a fastest time since '07 too. I am impressed how much you think and can then remember afterwards to put in the blog! I am guessing you still wear socks with the clogs? Great job Sasha! Nice to see the clogs work out so well, maybe you can get a sponsorship from Walgreens? Good job, Sasha, your comment about the geekiness of chess cracked me up - even more so about wearing a HRM while playing in a chess tournament! I also wonder what was going through the minds of the other non-FRB elites when they saw you toeing the line with clogs . . .
Everybody, thanks for the comments. Tom - after proper crazy grade corrections the Course Tool thinks this course is about 2:00 slower than Ogden, and tend to agree with it more or less. I figure the second half is almost identical to the second half of Ogden, but the first half in and of itself is slower by maybe a minute - minute and a half. The other minute to 30 seconds comes from the residual fatigue from the hills between 6 and 8. There are way too many 6% grades between 6 and 10. Thus we end up with a total of 1000+ feet of elevation gain, and this kills all of the benefits of the extra 300 feet of elevation drop. Plus you hit those grades at 5500 feet, while Ogden grades are hit at "only" 5000. So it is not surprising that the Kenyans failed to crack to 2:20 in spite of having every reason to do so and giving it their very best try. Compared to Top of Utah - I have not done the numerical analysis, but I do feel that I would have quite comfortably hit a low 1:12 first half had this been TOU even without the trademarked TOU tailwind. With it probably 1:11. Then second half in 1:17 does sound feasible. Less elevation drop, but pretty good tail wind from 13 to 15, and the lack of uphill from 6 to 10 would have left me with more energy. But the only way to prove it is to race TOU while in the same shape, which is the plan. Hopefully better shape, though. Chris - yes, socks are a necessity, you get bad blisters otherwise. Congratulations Sasha. Your report was exciting and inspiring; Made more so because you were happy in your accomplishment. This report is now one of my favorites. After these many years of seeing you run in clogs, or five fingers, I always want to tell you this story: There was a struggling, hardworking black singer/actress in the 1950's named Junior Drake. At an Oscar ‘after party’ in Hollywood she was noticed by a director who walked up to her and said : THAT, is a fabulous dress! To which she replied: Honey, it's not the dress, it's the girl. So for your many racing accomplishments over all these amazing years I'd like to add: it's definitely not the shoes. Thanks for keeping us inspired, and for giving us the FRB. Congratulations on breaking your dry spell. I'm curious, I think of clogs as wooden soled shoes without laces. I can't imagine you ran in wooden shoes. What are "clogs?" Sasha, I ran this race and got really bad blisters and eventually bloody feet due to the rain. Did you have no water/feet issues? Cam, no not at all. Sasha, did anybody ever tell you that you are hot? Well, this race report is anyway.